project 512Provide Sanitation facility in Endiyur Village of Marakkanam Block of Villupuram District, Tamil Nadu. Palmyra, the facilitating NGO, had organized a number of training programs both at the village level and at the Palmyra centre to understand the present toileting facilities and practices and to make aware the women the need and use of hygienic sanitation facility. Based on these interactions and Palmyra’s previous experience with women groups of the village, Palmyra identified a 3 member working Committee to be assisted by one field worker form that village to implement the project. The names of working Committee members are: Mrs Manickkammal, Mrs Tamilselvi and Mrs Bhavani while Mrs Valliammal is the field worker. The working Committee members are held in high esteem by the community for their integrity, honesty and managerial skills. They are also active workers in Women Self Help group and understand the local community and issues very well. The working group took full charge of the project from identifying suitable beneficiaries, working with them in their planning, design, construction, operation and allocation and management of funds. The working Committee selected the beneficiaries based on the criteria of the beneficiary interest, able to contribute in cash and kind, willing to put their own labor for construction and undertake that they will not allow the toilet to remain incomplete and will make use of the toilet in the most hygienic way. While selecting the households for this project, those households who can afford to and well above small and poor household were left out of the project. Socio-economic consideration also played a role in selecting the beneficiaries for the project. Palmyra has closely monitored and made sure that the poorest of the poor got the first priority. Palmyra also monitored all the activities undertaken by the beneficiaries and provided guidance to the core group. The Working Group sat with each and every beneficiary along with mason and technician and planned the toilet location, its design and worked out quantities and estimated the cost of construction. One of the important aspects of this way of planning is that it is demand driven in the sense that the beneficiary has decided its own design, including location, size and components such as toilet with or without bath attached. In deciding the various aspects of toilet construction, the ability to pay for the extra cost was taken into consideration. An important lesson that we, the NGO learnt in this project is that type design put forward by the NGO/ facilitator did not attract much attention from the beneficiaries. Also, there was a great demand to combine both toilet and bath which shows that bathing facilities is as important as toilet facilities. The beneficiaries claim that both toilet and bath must go hand in hand to get full benefit of providing hygienic environment for a household. One of the important advantages claimed for combining toilet and bath is to get away from water stagnation near house which is a breeding place for mosquito resulting in malaria and dengue fever. For implementing the project components, Palmyra was requested to purchase and provide good quality materials for toilet pan, pipe and pipe fittings, door etc., while the building materials such as brick, sand, cement will be purchased by the beneficiary and construct through hired mason with labor input from the beneficiary. The working group and Palmyra will supervise the work. In the first phase, ten beneficiaries were selected to assess the beneficiary response in this activity. The impact evaluation study conducted after completion of these 10 toilets and their use indicate that beneficiary response was excellent especially their spontaneous involvement in completing the structure in time and putting to full use by the beneficiaries. In the second phase, Palmyra selected another 15 beneficiaries and the work was completed within the time frame. The lesson that we, the NGO learnt in this project is that how individual household is in dire need of having toilet and bathing facilities and how they value these structures, especially women folk of household. Women are the most involved in this project and they are even ready to borrow money and complete the structure in time. •	The changes that came out by completing this project are: Empowerment and self-esteem of women; better health care for women and children because of better sanitation and clean environmental surroundings, better hygienic practices by household members. •	As a group involved in the project, they are able to plan in a participatory mode, design, construct and operate with self- confidence and leadership qualities. •	Participatory approach as implemented by Palmyra in this project has paid a rich dividend by way of constructing robust, long lasting toilet system which each and every family involved in this project consider as a JEWEL in the crown of their household structures. ten toilets are in completion stage. Book keeping training was held at palmyra centre to record the toilet construction cost. Together with PALMYRA team I visited the project village and participated in the working group meeting.Organization has formed a working group among the beneficiaries. This group member's work together and are responsible to purchase the material, hire a mason and supervise the construction work. Even though they are responsible for mobilizing the beneficiary to organize the resources in time to finish the work and also support them with funds if it is needed. And get back from them in installments. I visited the five toilets and found that the community members have not only built the toilet but also made a bathroom along with the toilet.These toilets are built nicely, finishing of the toilets is excellent. Quality of doors and material used is good and you feel good to use the toilets. Completed 10 toilets and handed over to the Beneficiaries. have seen the toilets constructed by the beneficiaries in the village. After the visit, we had a meeting with the beneficiaries at the village panchayath- office. I discussed with participants about the people’s participation in the program, contribution of collection, providing space for toilet facility for privacy to women, method of construction, etc. I made demonstration with locally available paper tea cups and a straw, explaining the system of the septic tank construction method in a simple manner, explaining the necessity of constructing the toilet system in a correct way as otherwise the purpose is defeated and the system won’t work. Done correctly it to separates the silt, water and facilitates out- flow of surplus water. we appreciated to the beneficiaries that this very nicely and aesthetically pleasing toilet-construction can be used by “any country’s Prime Minister” and also appreciated and advised to the local mason’s to construct the toilet’s in a good and correct manner. There can be no compromise on the correctness of the construction. And suggested to the VPP to organize a meeting for government sanitation department staff to have a look of this toilets to learn about the individual family member’s participation and their involvement in construction of good quality of toilets with family member’s physical labour. I thanked to PWX for supporting the sanitation facility for poor rural people. Village Panchayath President (VPP): He made request to increase the number of toilet facilities in the village to cover more number of households. Mrs. Kusum replied that if they get reports and SMS in time, she will speak with PWX board and if possible we will inform of the same. Ms. Nayana , Ashram School also visited the activity to learn about women participation in sanitation program. Mrs. Dhanam told that another 15 members have already been identified with the help of the working group based on the given criteria’s. They can start the construction work soon. Beneficiary use their money and get loan from the Women SHG's to build their toilets after completion they get funds from the Palmyra.at the end of the meeting we distributed the PWX contribution to the individual beneficiaries. Mrs. Tamilselvi, Working group member, gave thanks to PWX and Palmyra for initiating the sanitation facility through women self groups for the rural poor families. I visited the project in Endiyur village of Tamil Nadu.I was good to see the toilets build by the community with support from PWX and Palmyra. Good thing about project it is purely implemented by the women SHG'S, they select the beneficiary and purchase the material and distribute to the beneficiary, Beneficiary also have to contribute in terms of labour or material. After the completion of the toilets women SHG's give remaining amount to the beneficiary. women SHG'S also provides loan to the beneficiary if they don't have sufficient money to build the toilet at reasonable rates. I visited the project in Endiyur village of Tamil Nadu.It was good to see the toilets build by the community with support from PWX and Palmyra. 2. Mr. Sathiyamoorthy, Sanitation Officer, Block Development Office, Marakkanam Block. 1. Mrs. Tamilselvi, working group member has welcomed the participants for the meeting. 2. Mrs. Dhanam, Project Officer, Palmyra given introduction about the importance of the sanitation and drinking water use and maintain the water bodies clean and water contamination due to human waste, field run of fertilizers, etc. 3. Mr. Munusamy, Panchayath president has appreciated Palmyra activities implementation in the village for the welfare of the people. He has compared with the government sanitation program and the PWX activity and explained to the people to use the facility in a appropriate manner. He also requested to increase the number of toilet facility for the village. 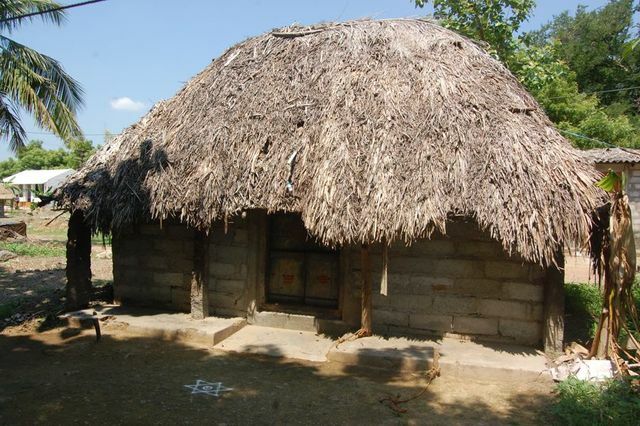 There are 1050 families living in main village of Endiyur (775)including the habitation of Kuruvammampet (275). There are 50 Households (Pucca House) having toilet facility. Palmyra is providing sanitation facility for another 25 poor families under PWX project. The PP requesting the PWX to increase the no. of sanitation facility to cover the entire village. 4. Mr. Sathiyamoorthy, Sanitation Officer, BDO, Marakkanam Block informed that the people should use the toilet to avoid the open deification. He has suggested to the beneficiaries, after completion of the toilet construction, they can fill the prescribed application form and submit it through Palmyra to claim subsidy amount from BDO. He also explained about the personal hygiene and health aspects. 5. The beneficiaries point of view: They feel happy to construct by themselves to organize only mason, helper role done by the family members, organized quality materials of bricks, sand and other materials, construction size, attached bathroom, etc. Mrs. Ponnammal family has completed the toilet. Mrs. Ponnammal with her Younger Son Mr. Elangovan was received cash through the village panchayaths president during the meeting. He said that he is very happy to utilize the toilet by 3 families’ together living in same house. He has designed and constructed according to their interest with attached bathroom facility. He thanked to the working group, Palmyra and PWX. Apart from 10 beneficiaries, others made request to Palmyra to select them for remaining 15 toilets construction facility. Palmyra informed them that we will visit the beneficiary family and select the beneficiaries based on the criteria. The meeting was ended in the afternoon. 	Palmyra project Officer and Field Worker have introduced about the sanitation activity which is supporting by PWX, Bangalore for the development of the rural area. 	There are 15 members from various SHGs were presented in the meeting. 	Explained about the possibility of construction of septic tank with toilet to provide the sanitation facility at individual household level. 	The participants said that they will have discussion with their family members and inform in the next meeting. 	Palmyra explained about the contribution, availability of space, willing to utilize the toilet, physical work contribution during the construction of toilet like curing, making dig for septic tank, etc. •	Palmyra field worker participated in the village level meeting to discuss about the interest for identification of the beneficiaries. •	They have selected 10 members to start the activity as a first stage. •	The beneficiaries were chosen based on the space availability, patta for housing area, willing to contribute, approach Block Development Officer to access Govt. fund for sanitation activity. •	The people had contradiction about the construction. Either fix one Mason with One Helper or individual household can construct the toilet by themselves with their own people. •	Beneficiaries are expecting to construct by themselves. Some of the beneficiaries have completed construction of house under the Govt. program, that has balance materials of bricks, sand, jelly, they feel that they would like to use the material for toilet construction work. •	The beneficiaries will invest Rs.10,000/- as their own fund, after completion of the toilet work, the individual beneficiary will apply to the BDO to claim the toilet cost . •	Project Officer and Field worker from Palmyra facilitated the meeting for Beneficiaries with Mason & helper with Engineer. •	Engineer (Beneficiary Husband) who helped for preparation of the sketch / drawings for the toilet with estimate for construction of one toilet. The estimate is given below in table 1. •	Some beneficiaries would like to construct with simple method with low cost. Few members felt that the septic tank should be cleaned 2 years in once, so it can be little bigger for more than 5 members in a family/joint family. •	The Mason asked Rs.7000 as a labor for construction and completion of one toilet with septic tank including plumbing, door work. •	As per the request of individual beneficiary, If Mason does any additional work like bath room facility, increase the size of septic tank for joint families, the additional labor will be paid by them. •	Participants made request that they can construct the toilet as per the design with estimate. Palmyra can organize doors, toilet sink, pipes and fittings only. •	During the construction Palmyra do the facilitation work to complete the work properly. •	Palmyra will have link with the people from starting the activity to use the toilet. •	Palmyra also will help the people to receive the grant from the BDO with proper application form. Mrs. Ponnammal has completed the toilet construction work. She has spent an amount of Rs.40,000 for toilet and bathroom. Hired only Mason for 12 days and Paid Rs.6000 to him. Labour contributed by the household members. Sources of Income from the joint family (3 families)	Rs.250/day for 1 earning member = Family 3 Male earnings = Rs.250 *15days*6months * 3 members = Rs.67500/annual Income. Rs.5625/Average monthly income . Female 2 persons earn Rs.40 (Rs.40x2female x 15 days x 4 months)day as agri labour. Rs.80/ (Rs.80*100=8000) day for NRGEA work for 1 person in a family. Participants: 30 members participated in the meeting. Field Visit: Went with working group to all 10 beneficiaries to ensure the completion of construction of toilet. 9 toilets are completed, 1 is in completion stage. Photos are attached. The durability of toilet is more than10 years period. It is constructed in Pucca toilet. The people use the toilet until their life period. Even their generation also will use it. The revenue will be assessed like reduction in medical expenses, saving time and energy - after completion of balance toilet construction only. The less medical expense, no illness - continue routine work is the revenue under the project. High class people are asking to provide the facility. Village Panchayath President is demanding more number of toilelts for the village. 2 ladies made complaints to the Village Panchayath Council on 15th of August 2012, Grama Saba Meeting, they demand the working group to consider their completed toilet under the project. The working group clearly said that it is not possible due to they are rich and already completed the toilet before start up the project. •	The most important impact is that they can use the toilet at any time during the day and night without fear and fervor. •	They are the proud owners of robustly built toilet with bathing arrangement which has given them a status in the community and are self reliant. •	Each member of the family save about 1 to 11/2 hours each day which they are able to put to productive use and personal hygiene improvement. •	Water use has now increased in view of easy access to water in the toilet which in turn improved the hygiene of the family. •	Those who built the toilet have gained self confidence to construct such structures provided that they get some help and assistance. •	The project has also brought about unity among womenfolk through meeting, training and working together for a common cause. •	In the years to come by, toilet for each and every family in a village set up is a must because of peri-rural areas are converted into housing sites and there is no place for defecation. •	The women attended the impact meeting feel that their workload of taking the children outside the house for easing at odd hours has considerably reduced their workload. •	Reduced stagnation of water in and around the houses resulted in less mosquito menance and thereby reduced malaria and dengue fever. •	In the words of women, it is a worthy and beneficial project which needs to be replicated and up-scaled in all the villages where there are no toilet facilities. The Project titled” Provide Sanitation Facility in Endiyur Village of Marakkanam Block of Villupuram District, Tamil Nadu” is being implemented by Palmyra, an NGO with participation of beneficiaries and their contribution and financial assistance from Peer Water Exchange. Implementation of the project started in April 2012 and will be completed in March 31, 2013. Implementation is being carried out in two phases. In the first phase, 10 toilets were completed by participatory method of beneficiaries under the supervision of village working group and Palmyra. These toilets are under use. The impact evaluation indicates that as per the beneficiary statement, this is one of the best projects to get involved, get benefitted, empowered, and gained self confidence to do such work in future. The women involved in evaluation praised the way the project is being implemented and its utility for the entire family in terms of easy access, hygienic surroundings and free from fear of not getting out of the house during nights. The next phase of 15 toilets is also completed within stipulated time. In the words of women of this village “ This is a worthy project for the well being of women and should be replicated and up-scaled in all the villages where toilet facilities are not available”. The beneficiaries who constructed the toilet, they have knowledge on water, sanitation, personal hygience. Neighbourers also watching the village level activity, they are also asking the facility for their household. Preventing the agricultural area from open defication from atleast 25 families. They feel happy to use the toilet without fear of inects/snakebites, darkness, etc. Implemented Tank Rehabilitation Project with Water User Association Organiztions in the rural area of Vanur and Marakkanam Bloks. Implemented Pipe line irrigation from tank area to command area. Safe drinking water project implemented in 3 villages of 5 habitations. Presently implementing the sanitation activity in a village under pwx.